Ranger is a wild horse living in the rolling Kaimanawa Ranges of New Zealand. The lead stallion of a large herd, he protects his mares and foals from danger and takes them to safe places to graze among the tussock. One wintery day, Ranger hears the sound of a helicopter approaching. The Kaimanawa horses don't trust humans and Ranger has always kept his herd well away from them. He rounds up the others to flee, but after hours of being mustered by helicopter, he finds himself locked in a pen with over a hundred frightened horses. This will be his very last day in the wild. But it's also the first day of a completely new life — a life that Ranger at first finds frightening and confusing. But, with the gentle and patient care of the three sisters who have rescued him, it’s a life that Ranger will eventually grow to love. 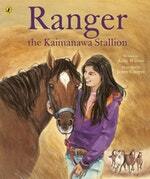 Love Ranger the Kaimanawa Stallion? Subscribe to Read More to find out about similar books.